A minor bathroom remodel is no minor undertaking. It’s actually a big deal because it involves a lot of work and quite a good deal of skill. This is particularly true if your plans include changing out the vanity and/or updating the lighting. When you think about a minor bathroom remodel, you probably conjure an image of a project that’s short-lived, taking only a weekend or maybe two. But, you should know there’s a lot more to it than that. 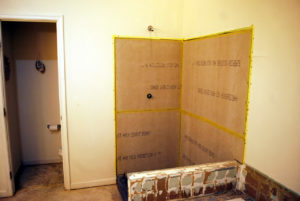 So, let’s take a quick look at some things you should know about a minor bathroom remodel. Firstly, we’ll talk briefly about the difference between a minor and major bath makeover. Major involves a complete gut and replacement of almost every fixture. While a minor leaves most things in place, with just a few key changes. What you should know is that a minor remodel typically returns a higher ROI. And, it’s less costly, of course. But, you can’t just update one bath and not the others (unless you plan to stay put for a while and will get to the others later on). That’s because, if you plan to resell, if only one bathroom is updated, buyers will balk. Now, well get more into the nuts-and-bolts of the project. Replace the faucet. This is a very simple change that does a lot to remake the space. It seems like it’s trivial but it isn’t. Just by replacing the sink faucet, you’re transforming the space in a savvy way. Re-caulk the sink and shower. You’ve probably noticed the sink and shower caulk looks a bit old and worn. You can re-caulk the sink and shower to fix that and make it look new again. Replace hand towels and guest soaps. Another subtle change with big impact is to replace the hand towels, the racks, and those dusty guest soaps. When you need remodeling debris removal done right, phone 800-433-1094 or visit Junk Garbage Removal.